Royse City TX: Region 2 COCI Meeting. We have to admit it's really cool when someone that hasn't a clue of our world comes inside. Whatever perception they had from TV, Movies, News or Narratives spun by the law are quickly blown out the window. It's replaced by mystique, fascination, awe, history and truth. They see it, feel it and mesmerized by it. We give them as much history and "truth" as we can in such a short period of time. 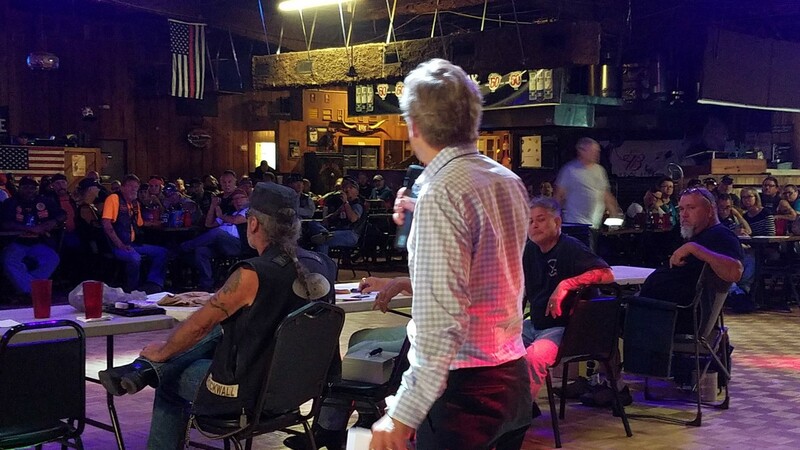 As much as some folks hate politicians it's the cards we've been dealt when it comes to seeking Biker Rights. As we've said many times its incredibly hard to get a Bill through the State Legislature, first we've got to find a sponsor that's sure of re-election, what committee a legislator might sit on helps and a willingness to fight the Law Lobby to a point. No Politician will commit political suicide. They look to build a coalition to support the Bill in the House and Senate. They do work with each other outside of controversial issues like abortion. It's the reason we don't care which side of the isle they sit on. As we see it our job is to educate them with a good dose of the truth, common sense and find common ground. What can be more common sense than the Dead Red Bill? Our ammunition belts are full. The failures in McLennan County, White Settlement, Any and "all" Profiling videos (video your traffic stops). Meanwhile we continue exposing the corruption of Outlaw Public Officials (OPO"s) that exists across the land. This includes Law Enforcement, Judges, Politicians and the media. When we work together we leave a big footprint. We do have untapped power using social media. We've done good but we can do better. In the society we live in today everything is political. Thinking your going to ride off into the sunset wearing a patch without scrutiny by the law or outside sources is dangerous. Realize there are forces with the country that are hacking away at the Constitution every day, every minute. "Imagine" an unchecked McLennan County. Look no further than Washington DC, where Federal Courts across the land, FBI and DOJ run a muck, setting false narratives.